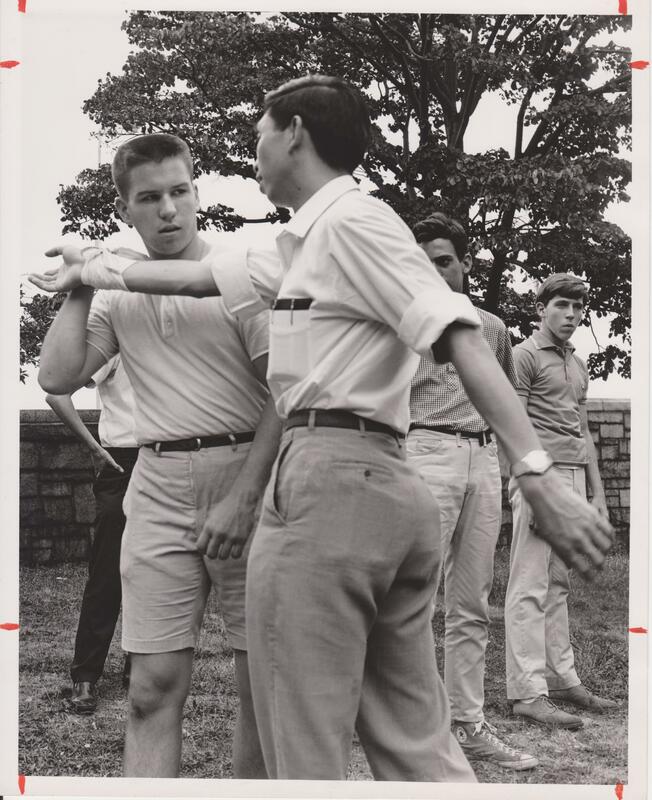 William Chen, demonstrating Taijiquan in NYC during the summer of 1965. Source: Authors Personal Collection. I recently came across a file that turned up in an estate sale. It appears to have been part of the archives of a now defunct local newspaper that covered events in Manhattan’s Morningside Heights and Riverside neighborhoods in the 1960s and 1970s. This particular file caught my attention because it contained two press photos taken at one of Master William Chen’s very first Taijiquan demonstrations in New York City, as well as a (partial) clipping of the article that covered this event. Both William Chen and his teacher, Master Zheng Manqing, played a critical role in the introduction and spread of Taijiquan in American popular culture during the 1960s and 1970s. As such I was thrilled to run across a first hand account (with photos!) of one of Chen initial demonstrations during the summer of 1965. Perhaps a few dates will help to put all of this into its proper context. Chen’s performance was not the first exhibition of Taijiquan in New York City. That honor goes to Sophia Delza, a professional dancer and student of the renowned Ma Yueh Liang and his wife Wu Ying Hua who taught Wu style Taiji in Shanghai. She first hosted a Taiji exhibition at the MOMA art gallery in 1954 and by 1956 was teaching classes at the UN. In 1960 she graced the pages of Popular Mechanics (which occasionally covered the martial arts) and gave the first televised demonstration of Taiji in North America. Later in 1961 she published one of the very first English language books on the Chinese martial arts. Still, outside of a relatively small circle of martial arts students in New York, California and Hawaii, very few Americans knew much about the Chinese fighting systems, including Taijiquan, in 1965. This was more than half a decade before the Bruce Lee inspired “Kung Fu Fever” that would bring the martial arts into mainstream popular culture. And even within the martial arts world, actual information on the Chinese styles remained limited. Black Belt magazine first featured a Chinese master on its cover (Wong Ark Yuey) in January of 1965, and it only started to feature regular article about these systems in the next few years. Nor would Bruce Lee appear on national television until 1967. The account presented below captures an important early moment in the popularization of the Chinese martial arts in North America. Yet something other than the date caught my attention as I reviewed the file. It was the sheer strangeness of the photos. Over the years a few standardized “scripts” have developed for how we discuss and think about the Chinese martial arts. Hard qigong feats (while quite popular in public demonstrations in China) never seem to have become a central part of the western understanding of the meaning of these fighting systems. Yet the very first photo in the group showed William Chen, face covered with a towel, having a large stone broken across his abdomen. Nor, as the attached article makes clear, was this exhibition incidental to his attempts to demonstrate what Taijiquan was to an American audience. Aficionados of judo, karate, and other disciplines of self-defense may see a virtuoso demonstration of TCC (Tai Chi Chuan), or Chinese Yin Yang Boxing by a former Formosa Champion, Master William Chen on Friday nights through August 27. In the first of these series at the Riverside Table Tennis emporium on 96th west of Broadway, Master Chen broke wooden boards with wrist chops. Absorbed repeated blows to his abdomen without obvious ill effect, and had a volunteer split a boulder with a sledge hammer. The boulder was perched atop Master Chen stomach. Master Chen was introduced at 9 p.m. by Marty Riesman, two time US Table Tennis Opens Champion, and owner of the Riverside emporium. Mr. Riesman, a lean urbane figure supporting himself on a cane, drew laughter when he asked the audience not to draw conclusions about the relative hazards of ping-pong and TCC from his appearance. His foot was in a cast because of a recent injury, related to neither sport. Master Chen, a thin, soft-spoken young man in a black gym suit executed the 37 movements of Tai Chi Chuan, a series of slow, ballet-like movements of wrists and arms done while shifting one’s balance from one leg to another and turning in place. He performed them with cat-like smoothness, wearing a look of rapt concentration. The velvet grace of these movements is deceptive. They are the foundation of the combat technique by which Master Chen defeated 50 judo, karate and Chinese boxing experts in 20 days to clinch the Formosa Chinese Boxing championship in 1958. The Formosa fights are no tea and fortune cookie affairs. Death and serious injury are part of the game. Only two tactics, gouging and choking, are outlawed. Otherwise everything short of pulling out a knife goes. While the rock was being split…. It is unfortunate that the file contained only a partial clipping of the 1965 article. I am sure that I could dig up the entire thing at some point, but it would probably require a trip to the New York City Public Library, or the Library of Congress. Luckily we have another source that helps to put this demonstration into its proper context. Better yet, while written a few years later, it actually directly references the events of 1965. In August of 1968 Black Belt magazine ran a major piece profiling William Chen and his growing school in New York City. Titled “The Barnum of Brawl,” this article by Bronson Dudley (not the smoothest of writers) sought to explore the inherent tensions between Chen’s use of flashy demonstrations and his dedication to both internal training and serious self-defense. Of course the reference to P. T. Barnum is doubly intriguing given the showman’s central role in promoting key image of Chinese life during the 19th century, just as the spread of the martial arts did in the 20th. [By-line] Call it showmanship – all this rock-breaking and plank busting, but William Chen is selling his Americanized Tai Chi Chuan through such gimmicky techniques. Underlining it, thought is a modern plan towards self-defense. There has been no survey undertaken to find out the estimate of karate students who have been drawn to dojos simply by the fascination of physical displays, but the number must be amazingly high. And there should be a survey of those who have returned to karate tournaments simply to find out if what they saw the first time was done with mirrors. Evidently, the display is the most popular spectator sport for the newcomer and in its way, it has popularized the sports and created, nay, fostered an interest in the martial arts. One of the Barnums in this capacity is one William Chen who has become the major draw for more than one martial arts showcase and has attracted many students to his own portals in their quest to learn how its done. Chen sees no reason to discourage such endeavors. Although his dojo centers around the theme of self-defense, rather than rock-breaking or plank busting, there can be little doubt that the student is waiting for the opportunity to show some of his techniques in this order to his immediate circle. Actually Chen’s career with the martial arts stems back to 1955 when his father, who took him to Taiwan in 1949, introduced him to Chen Man-ch’ing, a well-known Tai Chi Chuan master. One week later, Chen enrolled in his dojo beginning a relationship which culminated in two and a half years of study. For those believing in the metaphysical, Chen’s ardent study has all of the ingredients of a dime store novel. An earthquake shook Taiwan and left a cavernous hole in the professor’s house. Since the teacher could not be home all of the time, he asked Chen to move into his home and act as a watchman – in exchange for lessons in the martial arts. Chen found out that he got more than he bargained for….. In 1962, Chen, now a New Yorker, came to the United States and headed up Tai Chi Chuan dojos in Hawaii and San Francisco. In 1965, he arrived in the Empire City and the rest is history. His demonstrations drew students to his own school and each demonstration was promoted with the adeptness of a circus advance man. Promotion was the key which drew 300 people to the portals of a small hall in New York’s upper west side, his initial venture. It has been more than two years since Chen became a New Yorker and his teaching of the Yang style of Tai Chi Chuan is an example of doing thing “the American way.” Classes are held in a sparsely furnished loft and there are no uniforms. The atmosphere is informal. A beginner entering the school starts out by learning the 37 basic postures of “forms” that are the foundation of Tai Chi Chuan. The student moves slowly through the forms building up inner energy and learning step-by-step what he is doing. To give up muscular strength is a fundamental principal of Tai Chi Chuan, according to the instructor, which is based in yielding. While Chen is devoted to his martial art, he is also critical of it. He claims that the major criticism has come about because of the long time that it takes for a student in China to learn the forms. There a student spends from five to ten years – sometimes more – on the forms alone. Chen feels that this method of teaching is too old fashioned and should be changed. In his school, three or four months is sufficient and within one year after learning the forms, a student should be able to defend himself. Is this Americanization of the martial arts? “Well, this does not mean he will be a master,” he admits. Tai Chi Chuan masters do not stage matches because they feel it would be too dangerous, but Chen plans to change this in the near future and hold matches between his students. He intends, however, to provide protective equipment over the vulnerable parts of the body. William Chen is making his name as a man who is bringing more and more people into the martial arts and whetting their interests through the gimmicky display of strength and durability. But underneath such showmanship techniques breeds a hard-nosed endeavor to make every man who studies under him a worthy defender of his life and limb. As one might expect, not all of the Master’s students were equally happy with this article (though Chen himself lists it as one of the major pieces that helped to promote his teaching career in the US, along with a chapter in R. W. Smith’s book Chinese Boxing.) Johnny Lew sent the editors a blistering letter of protest, excerpted in part below. Two things about this letter strike me as particularly noteworthy. First is the invocation of Chuck Norris as a foil for the excellence of a Chinese master. Of course Norris would later come to play a similar role in countless discussion of Bruce Lee’s martial prowess. Secondly, the issue of whether Chen “Americanized” his teaching methods, and what such a charge might actual mean in both substantive and more theoretical terms. Obvious Chen was experimenting with certain things. Yet a lack of formal uniforms and undecorated practice spaces is actually pretty typical of the Chinese martial arts world. It is interesting that a martial arts writer during the mid 1960s would identify this as an “American” trait. Regarding your article on William Chen, “the Barnum of Brawl,” (Aug.) your article is very inaccurate…. Mr. Chen has no “gimmicks” as you call them. At demonstrations, he doesn’t do anything phony as you imply in the article. If you don’t believe me ask Chuck Norris! He punched Mr. Chen’s stomach at the East-West tourney! You, with your title, “The Barnum of Brawl” give the impression that Mr. Chen is just a good showman. I am also disappointed at the photos you chose. We supplied the writer with many fine action shots. The reason the article was written was to promote the self-defense aspect of Tai-chi Chuan, but after your article, I don’t know if that’s going to happen. Furthermore, if some people wanted to see still movements of the Tai-chi Chuan form, they could have referred to your past article on it or bought a book. Another thing, Mr. Chen’s teaching methods are not an Americanization. It is just his better teaching methods and his is teaching the art by himself with no help from any other Tai-chi instructors. BLACK BELT is great – except for this article! Letters to the editor. Black Belt. October 1968. pp 3-4. Zheng Manqing, the teacher of William Chen, with sword, possibly on the campus of Columbia University in New York City. Many (though probably not all) Chinese stylists in North America eschew, or at least seriously downplay, the significance of hard qigong performance today. 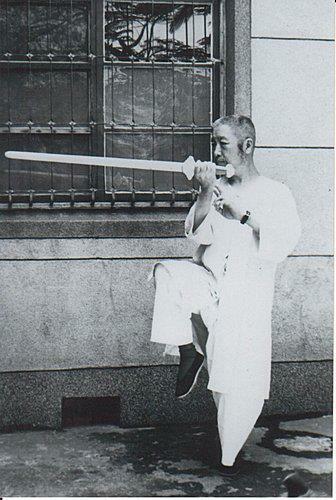 While there is substantial disagreement as to what the ultimate purpose of kung fu actually is (self-defense, physical health, self-actualization…. 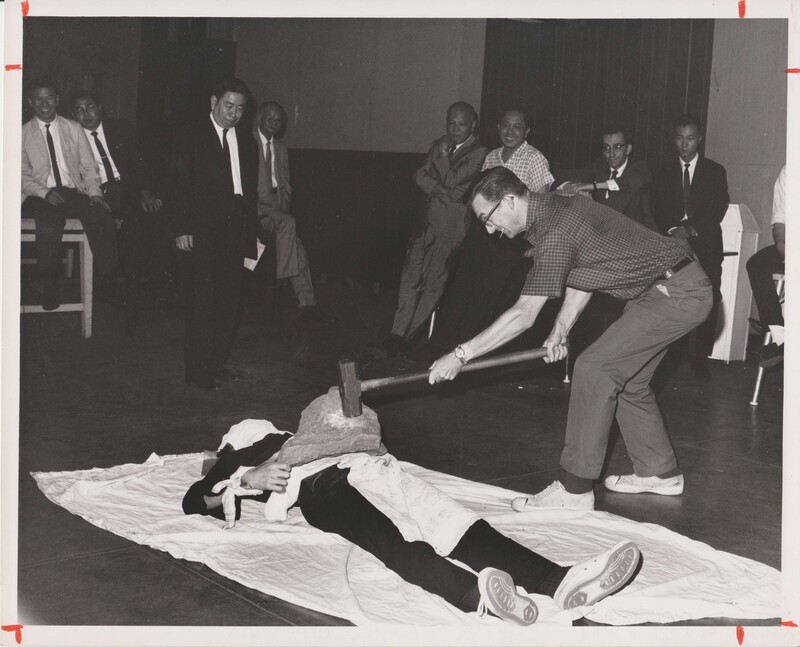 ), nearly everyone agrees that having boulder’s smashed across one’s abdomen is a “distraction.” Oddly, as the Black Belt interview indicates, even Chen was uneasy with these demonstrations. Yet they were a critical part of the larger effort to define and promote a certain image of the martial arts in the popular consciousness prior to the time when these arts started to be encountered through action films and popular television shows. I suspect that much of this shift in emphasis comes down to the more basic question of what communication mediums martial artists had access to in the 1960s. Both then and now there seems to have been an overriding emphasis on proving the “reality” of the martial arts. Yet how does one do that, especially when attempting to communicate with a public that has little or no background on the subject? Prior to the age of televised martial arts, public gatherings in the form of exhibitions, demonstrations and tournaments seem to have been one of the main ways in which martial artists reached out to the public. In these sorts of venues hard qigong stunts likely had an ability to convey both the potential and “reality” of the Chinese martial arts in ways that a forms demonstration, or even a sparring match, lacked. Of course these things were almost always provided anyway. Yet as the previous article notes, it was the broken bricks that often made the greatest impression on the casual observer. Most martial artists today are familiar with Bruce Lee’s thoughts on the value of such demonstrations, summed up by his famous dictum that “boards don’t hit back.” Yet earlier in his career Lee had also made a name for himself on the tournament and exhibition circuit. And by the time that he issued that statement he had a new medium with which demonstrate the “reality” of the Chinese martial arts. The small screen allowed him to display his speed and dexterity in ways that seemed more “real” than stunts that could now be replicated by a special effects department. Everyone wanted to convey the “reality” of their practice, but it seems that as the medium of public communication evolved, the message was forced to take on a new form. This brings me to my final point. Through years of evolution, public discussion and performance the Chinese martial arts have come to occupy a specific niche in the popular imagination. Sometimes, when attempting to explain the evolution and globalization of these systems, we accept this as a reflection of their essential nature. Alternatively, we might view their evolution in teleological or functionalist terms. This tendency seems to downplay the importance of chance and contingency in the evolution of both the martial arts and the discourses that surround them. The fascinating thing about time periods like the early 1960s is that they are full of unrealized possibilities. The image of the Chinese martial arts being promoted by Sophia Delza was different from that which dominated in the era of Bruce Lee. Likewise, William Chen’s Taijiquan exhibitions during the summer of 1965 in some ways contradict how that art is imagined today. In both cases many possibly pathways existed, but only one was taken. All of this should remind us that the Chinese martial arts, while seemingly timeless and unchanging, are actually dynamic social institutions. At every moment in history they are pregnant with unrealized potential. So much of what we happen to see is simply a reflection of the larger social institutions that they are currently interacting with. It is this inherent flexibility that will ensure the survival of arts like Taijiquan for many years to come. If you enjoyed this piece you might also want to read: David Palmer on writing better martial arts history and understanding the sources of “Qi Cultivation” in modern Chinese popular culture. Thanks for the hints on the authors. The images were a little under-exposed so I tried to lighten them to bring out some detail when I scanned them. Unfortunately I didn’t get the best results. I will try to re-scan them this afternoon and see if I can get something a little richer. yes, the author of the Wm. Chen article in Black Belt Magazine was Bronson Dudley.